Description and Definition of Muskets and Rifles: The native Americans called the gun a fire stick. Definition of Muskets: Muskets were muzzle-loading shoulder guns with a long barrel. The musket firearm was carried by the infantry of an army. Muskets and Rifles were brought to North America by the Europeans. The first types of firearms seen by the Native Americans were the muskets. Flintlock muskets were muzzle loaders having a flintlock type of gunlock that had flint embedded in the hammer. The flint made a spark that ignited the charge. The noise and the total unfamiliarity of muskets must have put fear into the Native Indians by the sheer threat of such a weapon and those that possessed this type of firearm. The Native Americans called the gun a fire stick. However, muskets were not very accurate. Muskets were designed to fire in volley and by this method could destroy a group of attacking individuals. But in North America the Native American Indian tribes fought as individuals and not as a force so muskets were not very effective against Native Americans. Native Americans in Nebraska did find use of the muskets. The first muskets used were lightweight, smoothbore, French flintlock muskets. Some were used by the Pawnee and Otoe tribes against the Spanish Villasur expedition of 1720. By the end of the 1700s the British Norwest muskets were acquired by Indians. During the late 1860s that the Native Americans began to acquire up to date weapons, in the shape of rifles, from the Europeans. These Indian warriors needed a short, light firearm that could be easily handled on horseback. The Great Plains Indians acquired guns from the French and British Traders. Apparently a common trading deal for the price of the gun was a stack of furs as high as the rifle. The trade of firearms had a startling impact on the Native American tribes of North America. The balance of power shifted to those tribes that possessed firearms and those tribes that did not which is further explained in the Beaver Wars in which the Iroquois League destroyed several large tribes including the Hurons, Eries and Susquehannocks. Native American Indians viewed the gun as a delivery system for poison, similar to a snake. They also admired the fox for its cunning and sneaky behavior. Tribal shamans convinced their tribes that such symbols included on firearms would increase the effectiveness of the guns. The Mandan tribe developed a ceremony to consecrate firearms. Many tribes attributed the outcome of battles to good or bad 'medicine, not the accuracy of the shooters. The bow and arrows were still used as the preferred weapons for hunting but rifles was preferred in battle because of their greater range, accuracy, and penetration. The first modern weapons used by Native Americans in any great number were the Winchester rifles and the Springfield rifles. The first documented use of these modern rifles against the opposition was when the Native Americans used them during the battle against General Custer at the Battle of Little Bighorn in 1876. About 30-40% of the 3,000-5,000 Native American warriors had rifles and pistols which included 20% with Henry and Winchester repeaters. Springfield rifles took their name from the Springfield Armory, established at Springfield, Massachusetts in 1794. Smoothbore muzzle-loading rifles were produced between 1858 and 1865 followed by single-shot rifles and eventually the Springfield repeating rifle. The 1840 Springfield rifle was one of the most innovational flintlock muskets for its times, having a 42�� barrel and firing a 69 caliber cartridge. The 1861 Springfield rifle musket had a long barrel of 40 inches, fired a 58 caliber and weighed almost 9 pounds. In 1898, Erskine Allin, the Superintendent of the Springfield Arsenal, developed the M1903 Springfield Rifle an American clip-loaded, 5-shot, bolt-action service rifle that was introduced in 1903 . Winchester rifles were famous for their rugged construction. The original Winchester rifle was made in 1866. This rifle had a lever-action mechanism that allowed the rifleman to fire a number of shots before having to reload - hence the term "repeating rifle". The Winchester repeater rifles is known as "The Gun that Won the West" for its predominant role in the hands of Western settlers. During the period that covered the Indian Wars and Battles the American government made several attempts to suppress the possession of firearms by the Native American Indians - even after the Indians were defeated. These attempts failed. 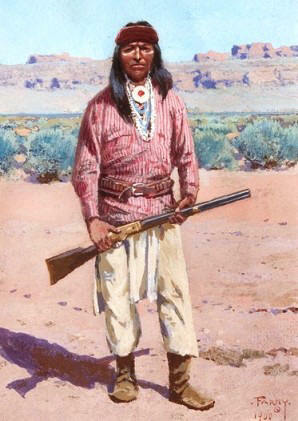 The Native Americans view the gun as a symbol of honor which plays a large role in their culture.